Used sparingly for 5 years and it has been unused for 10 years. Apparel manufacturers looking for alternatives to sew in t-shirt labels and garment tags (mainly to make the consumer more comfortable in their clothes and to reduce costs) have transitioned to tagless care labeling. 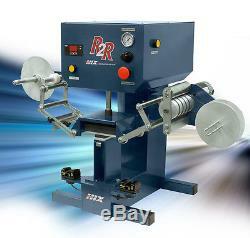 Speed, durability, and ease of use separate the HIX Digital R2R from all other roll label transfer presses. It is designed specifically for high production applications of tagless care labels with transfer times quick as one second on a variety of fabrics. Short web paths, tool-less web guides, and quick release lower platens decrease change-over times and eliminate excessive waste. The reader is programmable to detect virtually all colors in the spectrum in one quick step. Digital controls guarantee precise heat and time control, while the coreless take-up reel makes discarding spent roll stock quick and easy. The HIX Digital R2R is the perfect solution for your tagless applications. A manual pressure adjustment is located at the back of the platen mount. Certified electrically safe (ETL) The Electrical Testing Laboratory seal means HIX presses have passed a rigid and very demanding independent testing process, and have been certified electrically safe. 100% Made in the USA HIX has their own fully integrated aluminum foundry, CNC mill operation, welding, metal forming, wiring, fabrication, assembly, and packaging departments. Small footprint D16 x W33 x H26. 4x4 Standard Lower Plant Allows for transfer sizes up to 3.75 x 3.75. Digital Timer Adjustable up to 999 seconds shows countdown on read out. Digital Heat Control Adjustable up to 425°F and displays current temperature. Quick Release Tool-less locking hub for quick changeover between roll labels. Over/Under multicolor index reader Easily adjustable to read either side of label with teachable sensor for accurate indexing. 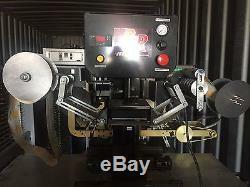 Optical Two-Hand Control Switches Requires operator to have hands clear of heat head when operating machine. Interchangeable Lower Platen Quick changeover of lower pad for shaped dies. Air Control (requires only 4cfm air) Fully adjustable pressure range control. Core-less Take up Reel Easily discard spent roll stock no core, no tape, jut simply place end of roll between reel fingers. Manual/Auto Selection Drive selection Button. Jog Button For manually advancing roll transfers during set-up operations. Electric: 120V/5A/600W, 220V/3A/600W Air Requirement: 4cfm Dimensions: W 33 x H 26 x D 16 Weight: 138 lbs. The item "HIX Digital R2R Hot Stamp T-shirt Machine" is in sale since Sunday, June 11, 2017. This item is in the category "Business & Industrial\Printing & Graphic Arts\Screen & Specialty Printing\Heat Transfer\Presses". The seller is "darenriley" and is located in Safford, Arizona. This item can be shipped to United States.